As I was sifting through some recipes last week I came across my grandmothers cinnamon roll recipe. We typically make cinnamon rolls around Christmas time, but I remembered my favorite reason to make cinnamon rolls in February. Heart shaped cinnamon rolls like these from Pinch My Salt. The last time I frosted cinnamon rolls I added a little bit of lemon juice to my cream cheese frosting and fell in love! I am pretty sure that is the trick the Cinnabon uses!! 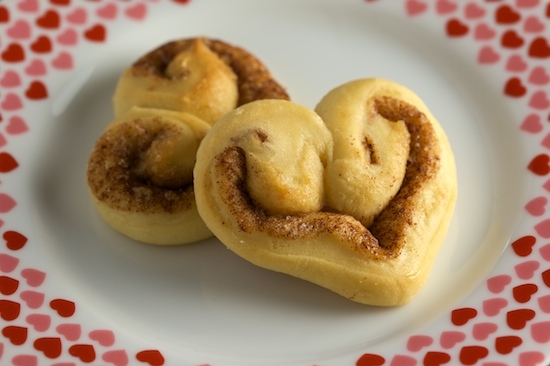 So if you do decide to make some heart shaped cinnamon rolls, try this recipe to frost them! With your mixer, combine cream cheese and butter. Add lemon juice and vanilla extract and mix. Slowly add the powdered sugar. I like to do it a half cup at a time. I don't sift mine, but I probably should. Spread it over you cinnamon rolls while they are still warm. Then give your yummy heart shaped cinnamon rolls to someone you love this Valentine's Day! so cute & looks so yummy! how cool! and easy enough for me to try..thanks! I am your newest follower..pls follow back if you can!